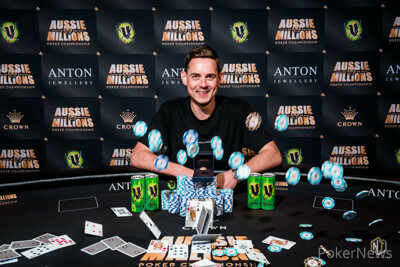 Defending Aussie Millions Champion Toby Lewis has won the 2019 Aussie Millions AU$50,000 Challenge for AU$818,054 after a heads-up deal with Manig Loeser. Lewis battled through an extremely long Day 2 to claim the overnight chip lead before continuing his dominance on Day 3 to clinch victory over the record-setting 62-entrant field. Lewis fell short of tasting victory a few days ago when he finished in second-place in the AU$25,000 Challenge, but now he has claimed retribution by adding the AU$50,000 Challenge title to see him claim his second victory on Australian shores with a 12-month period following his Main Event victory at the 2018 Aussie Millions for AU$1,458,198. With Lewis' victory in the AU$50,000 Challenge, he now surges to over $6.3 million in lifetime earning and passes Dave Ulliott on England's All Time Money List to sit in sixth-place overall to sit behind Charlie Carrel. "I’m just very fortunate. I think I played good and ran good. I didn’t even intend on playing it, I was so tired after the AU$25,000 Challenge. But it looked like such a good event, it got so much more players than last year so kinda felt the need to jump in and the guys were willing me in so I just went for it." Speaking about the field size, Lewis added, “It’s easy to say that having the recreational players here helps, but the thing is they started it. They were there from the start so with that, it draws a lot more attention to the event." The unschedule Day 3 began with five players following the early morning eliminations of Michael Zhang (7th) and Tobias Ziegler (6th) before play was halted just before 5 a.m. (AEDT) after nearly 13 levels of tournament action. 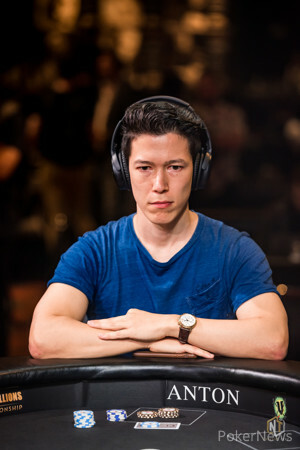 When the five players returned, it would be short-stacked Thomas Muehloecker finding two doubles through Bjorn Li, along with taking a pot off Dominik Nitsche, to position himself second overall on the leaderboard. Li then found himself in a hand from out of the big blind against Lewis where on the turn with the board reading he was all in holding against Lewis' . Unfortunately for Li, the river landed the to give Lewis a stronger two pair, and he would be eliminated in fifth place for AU$235,600. Nitsche would then commit his remaining chips the next hand holding and be up against Manig Loeser's . Nitsche managed to turn some additional win and chop outs, but inevitably was eliminated in fourth place for an AU$323,950 payday. Three-handed play began with Lewis holding more then half the chips in play as Muehloecker and Loeser were within a handful of big blind from each other. Although Muehloecker managed to gain some ground on his two opponents, he ran into Lewis' flopped trips, and then Loeser's turned pair to drop back down to a 19-big blind stack at break. Once play resumed, Muehloecker shoved from the small blind holding and Lewis looked him up with . A six on the turn left Muehloecker drawing dead, and he was eliminated in third-place for an AU$412,300 payday. 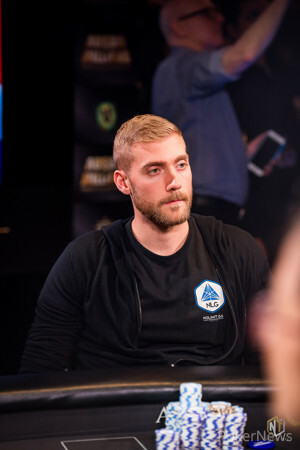 Lewis and Loeser both discussed a deal, but with Loeser at a near nine-to-one chip disadvantage and nothing to lose once the numbers were presented, the German pro decided to decline the deal and play it out. Immediately, Loeser secured a double when he was all in preflop holding against Lewis' . The dealer ran out a board and Loeser rivered a four-card flush. Several hands later, Loeser would have the better of the preflop clash when he took his against Lewis' , and when the board ran out , Loeser had closed the gap to be trailing 1.3 million in chips to 1.8 million with blinds at 12,000-24,000. The two players then took another short break before both agreeing to a deal that saw Lewis collect AU$818,054 and Loeser collect AU$772,246. 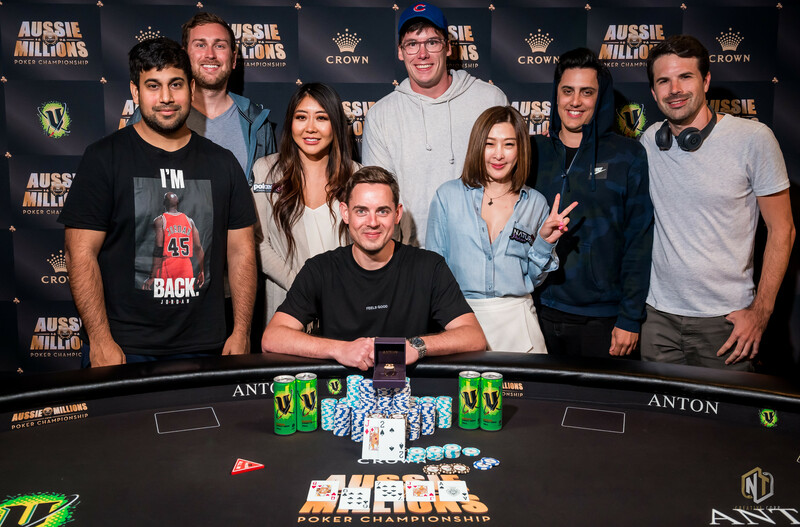 The two players then decided to flip for the title and when Lewis' connected on the board against Loeser's , he would be crowned the 2019 Aussie Millions Event #12: AU$50,000 Challenge winner, and recipient of the ANTON Championship Ring. Speaking about the heads-up deal, Lewis stated, "I would have just done the deal at the start of heads-up, but it wasn’t really in Manig’s interest to do that so we didn’t. I then doubled him up – twice! My heads-up game is not the strongest part of my game, for sure. These things happen. I’m very fortunate to get here so I’m not going to start begrudging my luck now." For Lewis, his last major tournaments at the Aussie Millions now sees him have a 1st, 2nd, and another 1st. Lewis still hasn't entered the 2019 Aussie Millions Main Event either, and will likely be jumping in today on Day 1c, or tomorrow on Day 2 before late registration closes. "Very different events. The Main Event is a marathon that you need to be extremely patient in and the structure is amazing. The structure is great in this as well but you’re playing against the highest calibre of players; just a lot more risk-taking I guess than being more risk averse in those big Main Events where I might feel like my edge is a little higher." Congratulations to Toby Lewis, winner of the Event #12: AU$50,000 Challenge and recipient of the ANTON Championship Ring and the AU$818,054 first prize. 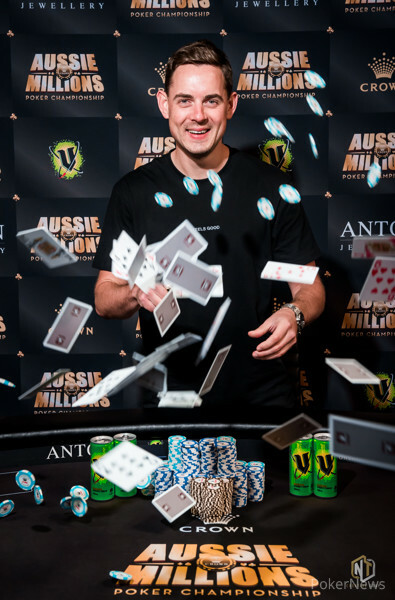 Stay tuned to PokerNews.com for continued coverage of the 2019 Aussie Millions with the AU$10,600 Main Event currently playing Day 1c, and the AU$100,000 Challenge coming up in a few days. Following the deal, both Toby Lewis and Manig Loeser agreed to go all in blind on the following hand, with one card being dealt face-up. The board ran out with neither playing hitting the board. Lewis then flipped over the and had the lead with a pair of jacks. Loeser peeled the which was not enough to take down the pot. Loeser would finish in second place for AU$772,246. Manig Loeser opened his button to 55,000 before Toby Lewis three-bet to 200,000. Loeser contemplated his decision for a few moments, and then announced he was all in for 657,000. Lewis called. The dealer ran out the board and Loeser secured another double. Toby Lewis called from the button before Manig Loeser moved all in for 307,000 from the big blind. Lewis snap-called. The board ran out to see Loeser spike a diamond on the river and win the pot with a flush after trailing with the under-pair. From the small blind, Thomas Muehloecker moved all in for 397,000 and Toby Lewis called in the big blind. The Austrian was at-risk, and when the flop landed , he would need to find an ace or king to stay alive. 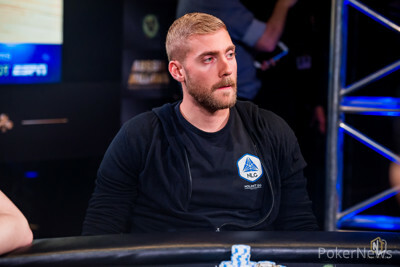 The turn landed the and Muehloecker would now be drawing dead against Lewis' set as the completed the board on the river and Muehloecker was eliminated in third-place for an AU$412,300 payday.